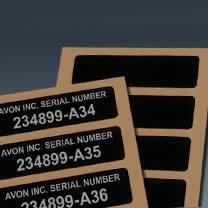 MPC’s Foil AlumaMark BlackPLUS blank labels and tags are the most durable solution for use with YAG and Fiber lasers. The black background is sealed beneath a sapphire-hard anodic layer that provides an impenetrable surface, and expected exterior life of 20+ years. Foil AlumaMark BlackPLUS blank labels are strong and lightweight, and are flexible enough to adhere to contoured or uneven surfaces. The foil label will fracture if removed from its mating surface, lending an effective security feature for asset tracking and product identification labels, property ID tags and more. Why Choose MPC’s Foil AlumaMark BlackPLUS Blank Labels & Tags? Black background is sealed beneath a sapphire-hard anodic layer for exceptional durability and produces high-contrast silver graphics. Background won't fade even in conditions such as extreme heat and humidity, long-term exposure to weather, UV, salt spray, abrasion, industrial solvents, chemicals and more. Imaged on a photosensitive anodized aluminum face stock. Photosensitive anodized aluminum face stock in .003”, .005”, and .008” thicknesses. Matte (non-reflective w/flat finish), Satin (lustrous semi-reflective material), #4 (brushed to resemble a stainless steel finish), Gloss (highly reflective, mirror-like). Note: Finish options may vary by material thickness. 15-20 working days from receipt of order and approval of artwork. Expedited shipment is available for an additional charge.